If you’re a budding musician, you may be wondering how to tune your guitar and what you can do to keep it in tune. Even for more advanced players, there are some interesting things about tuning a guitar that you may not know. 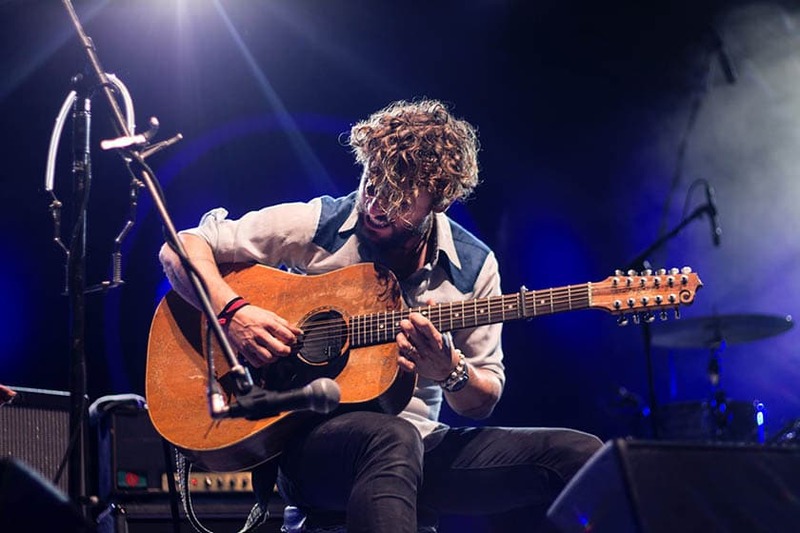 Standard tuning is the most common tuning so it’s good to begin learning what the standard tuning Hz frequencies are, the best kind of acoustic guitar tuner and how to tune with and without a tuner, while also looking after your guitar and it’s tuning keys. Keeping your guitar in tune may not be as simple as you think because there are many factors that can affect it. Hopefully, this tuning guide should cover everything you need to know. Sound waves are made up of different frequencies, measured in Hertz (Hz). If you want to your guitar to be perfectly in tune then you need to make sure that the string frequencies are spot on. Across music, the A above middle C, A4 (440 HZ), is used as a standard reference pitch for tuning instruments. This means that the pitch of all other notes is determined around this frequency to create a widely accepted standard pitch. The standard tuning of a guitar consists of E2, A2, D3, G3, B3 & E4 from the lowest string to the top. The A string is two octaves below standard pitch so this makes its frequency on a guitar 110 Hz. Notice how the frequency has halved twice. An octave simply means that the difference between two sound wave frequencies is x2, so two octaves is x4. Not all tuners will measure Hz and you might want to start early on training your ear with reference notes instead of relying on tuners if you are a beginner. Tuning keys, sometimes referred to as tuning pegs, are located on the head of your guitar and are used to adjust the tuning. You need to make sure that these are properly looked after because otherwise, your guitar won’t tune. Ensure that they are fastened on tightly to the head of your guitar and be aware that there is a lot of tension on them from the strings. An old guitar will have put up with this for years so there is a good chance that they are knackered and need replacing to help it stay in tune. Standard guitar tuning keys need the strings to be wrapped around them and can be time-consuming to replace strings with. If you’re replacing your tuning keys, consider locking tuners that won’t require nearly as much string winding and can help your guitar stay in tune better. A guitar is tuned by measuring and adjusting the pitch of the strings against a reference note, usually starting with the bottom E. You can get this reference point off a piano, electric tuner or even a guitar tuning iPhone app. People traditionally used tuning forks to tune instruments before electronic tuners. These are small pieces of metal that will resonate at a specific frequency when struck. Using tuning forks to tune can be fine in quiet environments but it will probably be a bit of a handful and hard to hear on stage. You could use other tuned instruments as your reference to tune your guitar. Many people use the notes on a piano and you could even use an online piano as a reference. This can help you develop a good ear for pitch but there is going to be a higher chance of inaccurate tuning. Once you have this first note, we can begin to tune the rest. A clever hack to know is that the note on the fifth fret of a string is the equivalent of the open string below it. For example, when you play the fifth fret on the bottom E string, that will be your next reference point for the open fifth string or A note. This works for every string apart from the fourth (G3) and fifth (B3) strings, where you play the 4th fret on the G to get a B. After you tune each individual string, you need to make them stay pitch perfect and you can do this by gently stretching them away from the fretboard and re-tuning each time they go out. You should also look at the different kinds of guitar tuners available to find the easiest and fastest way to tune up. The most common way to tune a guitar is to use a guitar tuner. 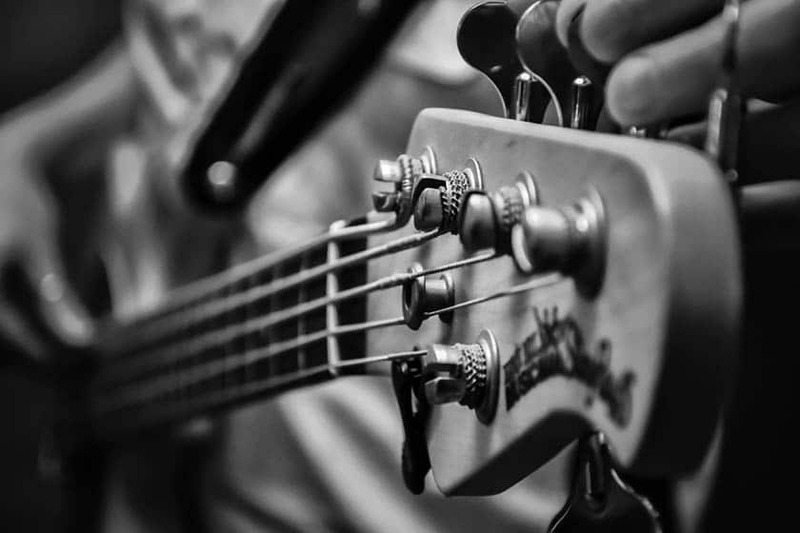 There are many different kinds but they all do the same thing: they tell help you tune your guitar by telling you the note you are playing and how close it is to standard pitch. This is by far the easiest way to tune your guitar. It’s good to know about the different options there are out there for guitar tuners and how to use them. 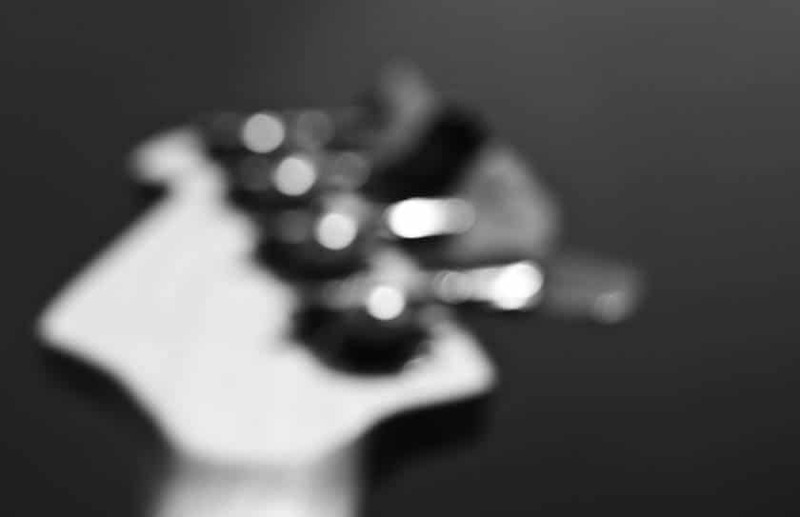 Here is some information on the different kinds of guitar tuners out there so that you can work out what will be best for you. Many performers choose to sing at open mics with an acoustic guitar so you should consider what option would be best for acoustic guitars. You will want to be quick and efficient at an open mic night so a clip on tuner will probably be the best option for you. You should tune 5-10 minutes before you perform but be mindful of other performers because it’s rude to tune when others are playing. These are a popular option amongst many guitarists because they are small, portable and clip right on to the head of your guitar. The price can vary depending on the brand and some can be very accurate. Although they are very useful, they are also very visible. However, there are more discrete options that can be just as effective. If you don’t want a clip on tuner hanging on your guitar while you perform, a pedalboard tuner could be for you. These are bigger and can fit alongside your other pedals in your setup. They usually need an external power supply and could be harder to see how in tune you are because they are on the floor, especially if it doesn’t have a clearly lit display. You can download guitar tuners on your phone or tablet and use the internal microphone to tune your guitar. App-based tuners are practical because it is likely that you will always have your phone on you. However, you are relying on the quality of your phone microphone, which may not be able to pick up your guitar in louder environments and are usually less accurate than other tuners. Check out Fender Tune for iphone and see a great list of options for Android users here. These tuners allow you to tune all of your strings at once instead of one at a time. All you have to do is strum your guitar and it will tell you the tuning of each individual string. These tuners are also very accurate but expect them to be more expensive than other tuners on the market. A chromatic tuner is the most common type of tuner. 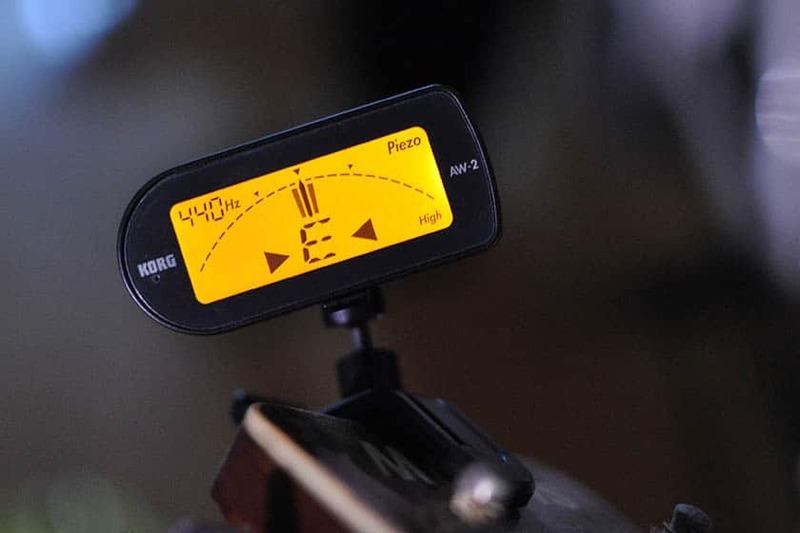 This will tell you the note you are playing and how far away you are from your desired pitch. Examples of these include most clip-on, pedal and polyphonic tuners. Non-chromatic tuners are still effective but they don’t measure all notes, only the ones related to the standard guitar tuning pitches. These tend to be cheaper, often coming with starter guitar bundles, and are fine for standard tuning but aren’t as flexible as chromatic tuners. Can you achieve standard guitar tuning with harmonics? When you don’t hold down the string but gently place your finger over specific frets, you divide the string and play a harmonic, multiplying the frequency of the string. On the 5th fret, this is a multiple of four and on the 7th this is a multiple of three. Tuning with harmonics is a common method many guitarists use to tune their guitar. Say you have tuned your first E2 string perfectly and wanted to use harmonics to tune the A2 string. You would play the 5th fret harmonic on the E2 then the 7th fret harmonic on the A2 and adjust it so it is in tune. However, some argue that this is a flawed method that leaves your guitar out of tune and there is evidence to back it up. Let’s look back at the frequencies of these two strings, with and without harmonics. There is only a marginal difference between the harmonic frequencies but if you were to tune like this across other strings then it could be noticeable. This is because you are going to try and match the harmonic at 329.64 Hz and if you do, then the A2 string will end up being slightly flat at 109.88 Hz. This knocks on to all the other strings so here is what the frequency of your strings will look like if you tune with harmonics. As you can see, the strings become more out of tune as you go along. You can’t use this harmonic between the G3 and B3 strings but if you use the G3 string as a reference then the final two strings will also be flat. 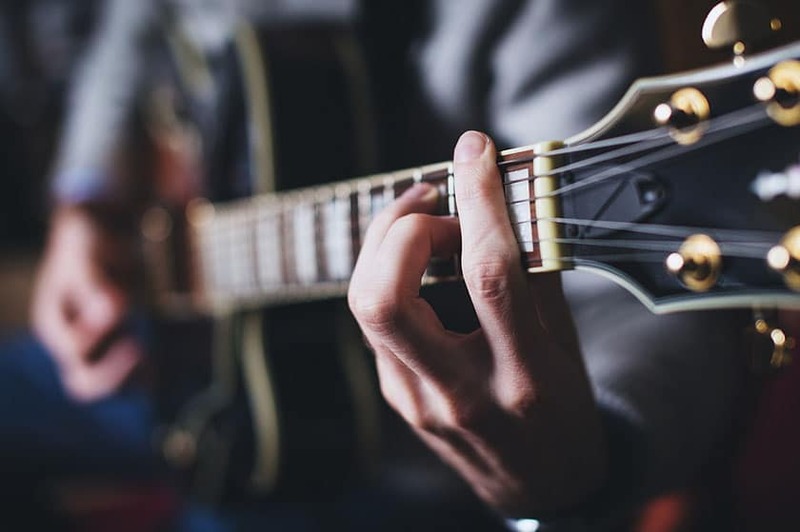 It is worth bearing this in mind because although you might find harmonic tuning fine for casual practice, your guitar is likely to go out of tune much quicker and you will only have one properly tuned string in the first place. If you have problems with your guitar’s intonation then this will have a direct effect on its tuning. This is when your guitar is in tune with the open strings played but is out of tune when you hold the frets down. This can mean that your tuner says your guitar is perfectly in tune but when you hold a chord down, it sounds awful. The way you can check if your intonation is out is to start with tuning one of your guitar strings. Then you need to check the tuning of the 12th fret of that string. If the tuning of that note is off then you need to adjust the intonation. This can be done by adjusting the string length on the bridge or saddle. If the string is tuned but the 12th fret is flat, then this means that the string is too long and you need to bring the saddle on that string forward toward the neck. If it is sharp then you need to move it back. This can be a really long process and some guitarists like to go to a guitar store so they can get it done professionally. If you want to do it yourself then try to learn a bit more about it first and set aside a few hours so you can get it done carefully and properly. Just make sure you get into a habit of checking the tuning of the frets as well as the open strings if you’re performing or recording. 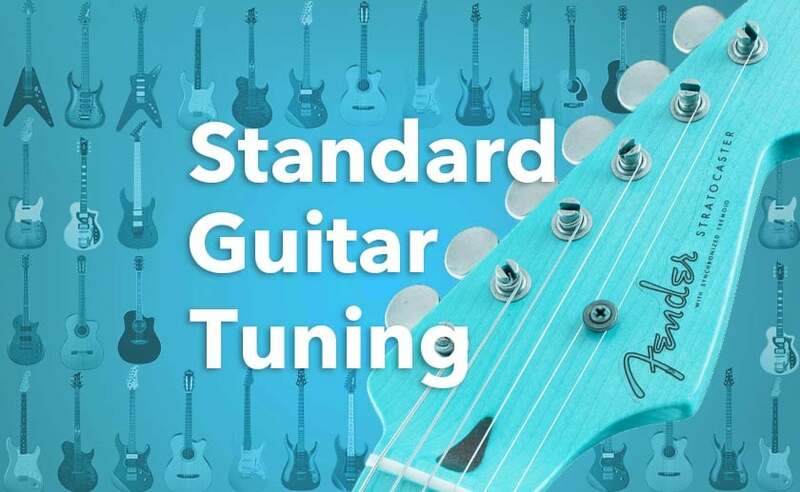 Standard guitar tuning – does it take a long time? Sometimes it takes beginners up to five minutes at a time to tune their guitar and cheaper models with older strings go out of tune a bit quicker than their more expensive friends but keep persevering. Bear in mind that tuning your guitar could be incredibly difficult if the intonation is out or if you’re doing it with harmonics. With practice, it is possible to tune a guitar just by using your ears which is a very worthy skill to own in the music world. 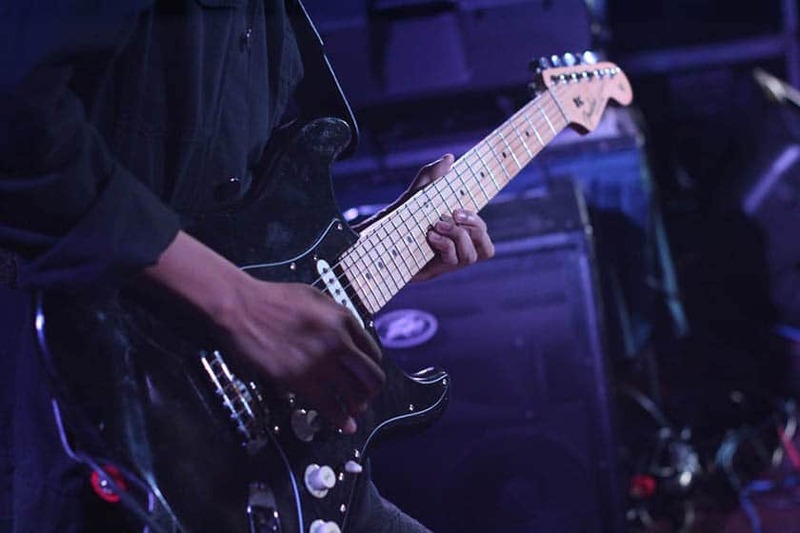 Standard guitar tuning: why and how often should your guitar be tuned? Have you ever been playing your guitar for a long and you can’t help but think the guitar doesn’t sound quite right? It’s quite possibly because the strings have changed pitch through all the hitting and bending so you need to regularly tune your guitar. HOT TIP: Find yourself a quiet spot to start your guitar tuning. It’s easier away from background noise and improves accuracy. HOT TIP: Go slowly when guitar tuning, if you tighten a string too much and too fast, it will break! HOT TIP: Buy yourself some high-quality strings that suit your style of playing. Older strings are also more likely to go out of tune quickly so keep them fresh! Let us know what kind of tuner you like to use and any tips you have for keeping your guitar in tune! Great tips, love the videos too. Thanks! Comprehensive modern information with the idea of tuning up ones hearing to be able to tune by ear. Brilliant.